Since 1917 The Modern Library prides itself as The modern Library of the world s Best Books . Its paperback series feature treasured classics, major translations of great works, and rediscoveries of keen literary and historical merit. Featuring introductions by leading writers, stunning translations, scholarly endnotes and reading group guides. Production values emphasize superior quality and readability. Competitive prices, coupled with exciting cover design make these an ideal gift to be cherished by the avid reader. Hailed as a classic upon its first publication in 1934, The Valleys of the Assassins firmly established Freya Stark as one of her generation's most intrepid explorers. The book chronicles her travels into Luristan, the mountainous terrain nestled between Iraq and present-day Iran, often with only a single guide and on a shoestring budget. 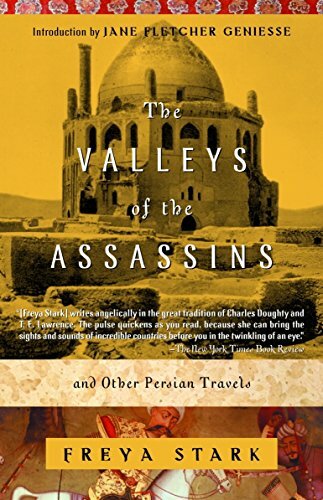 Stark writes engagingly of the nomadic peoples who inhabit the region's valleys and brings to life the stories of the ancient kingdoms of the Middle East, including that of the Lords of Alamut, a band of hashish-eating terrorists whose stronghold in the Elburz Mountains Stark was the first to document for the Royal Geographical Society. Her account is at once a highly readable travel narrative and a richly drawn, sympathetic portrait of a people told from their own compelling point of view. 292pp , IN ENGLISH, ABOUT THE AUTHOR ::: -Dame Freya Stark Madeleine , DBE ( January 31, 1893 , Paris , France - May 9, 1993 , Asolo, Italy) was an explorer and writer británica.Freya Stark was born in Paris , where his parents were studying art . His father, Robert , was a British painter and his mother, Flora, was Italian German-Polish descent. At age nine he read A Thousand and One Nights , and was fascinated by the Orient . Later he learned Arabic and Persian. During World War I he studied History in London and SOAS, University of London and worked with the Red Cross in Italy. In 1927 embarked towards Beirut with a friend . He traveled to the Middle East , sought and found the valley of the sect of the Murderers and Alamut . In World War II he worked for the British Ministry of Information , In 1953 he was awarded the Cross of the British Empire and was named Lady of the British Empire in 1972. He won several awards and literiarios 81 years and climbed some steps crossed the Himalayas. First published in 1934, Freya Stark's The Valleys of the Assassins and Other Persian Travels has been reprinted once again and is just as much of a gem now as then. At the age of 37, Stark shocked her fellow Brits by moving to Baghdad, befriending the locals, studying Arabic and the Koran, and then setting out on expeditions to remote and uncharted areas of the Islamic world by foot, donkey, camel and car. With her fascination for secret Islamic societies, she resolved to travel to former home of cult of the Assassins and locate an ancient fortress described by Marco Polo. There was only one problem: she couldn't find the valley on her map. Intrepid and indefatigable, she found a guide to lead her across the empty Persian planes and crested mountain ranges into the practically impregnable valley. There she found the castle ruins covered with wild tulips and surrounded by breathtaking views of the Elbruz Mountains, and charted the first accurate maps of the region.